These had to match her kitchen decor so powder blue and white were the thing. So let’s get into it. The colours I finally decided upon were Bulls Eye 0108 opal Powder Blue for the base, opaque white offcuts and stringers for decoration, then a clear cap. First I cut the blue base and clear cap, 90 mm x 90 mm. Then pulled out my containers of white offcuts and sourced several opaque white pieces for decoration. Finally, a few opaque white stringers. These were all cleaned up and then laid up on the kiln shelf. I use Bullseye Thin Fire paper instead of kiln wash. It costs a little more but is just so much easier. Then into the kiln for a full fuse. The firing schedule is below. This should have been a single firing project but as life likes to remind us things don’t always go to plan. 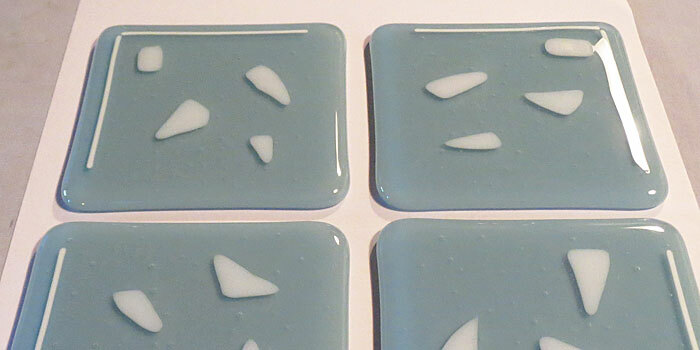 When they came out of the kiln the white offcut decoration showed a little devitrification. I have found this happens a little with white used in this way. Not sure why at this stage but not a great problem. This meant I had to then sandblast the surface to remove the devitrification and then back into the kiln for a fire polish. The schedule is below. As you can see the final product turned out great and I think Fay was happy. Either that or she was just humoring her little brother. Thanks sis. Anyway, don’t hesitate to try this. Play around with simple decoration using your offcuts. Unless you really overdo it you will usually end up with a great set of coasters.